Welcome! 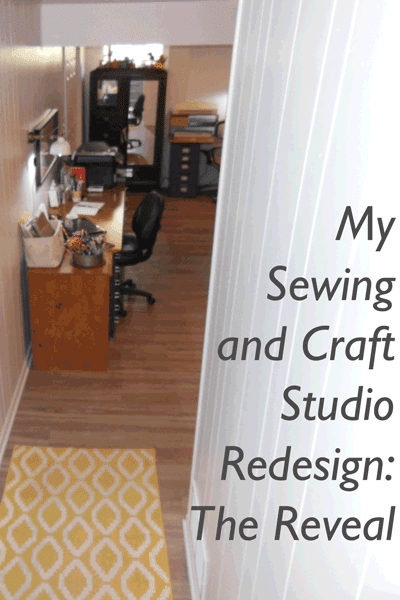 It's so exciting to reveal my beautiful sewing and craft studio to you at last! Thank you for hanging in there with The Vision, The Purge, and The Work. Come on in and have a look around. This is the front view of my desk. On the left is a 3-drawer file that I had planned to eliminate, but when I was putting everything away, I realized that I needed a place for crayons and paints and paper and other craft supplies for the grandchildren. On top I have a cute industrial style utensil holder with markers, scissors, and paintbrushes. 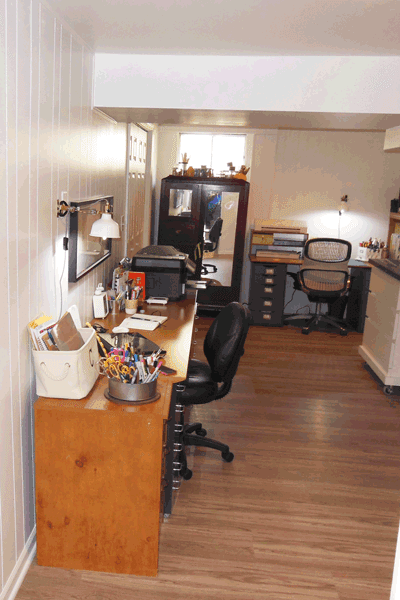 There is also a pencil sharpener and a fabric bin with notebooks and files that I use. 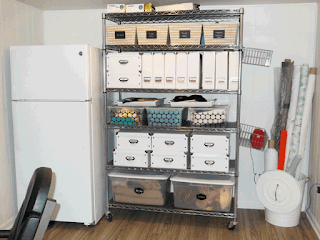 The gray files are Helmer units from IKEA and they are holding pens, paperclips, sticky notes, label makers and other like items. The file with the metal trim is from Knoll, as are the three worksurfaces for my desk, craft desk, and sewing table. This Knoll file stores various sizes, colors, and styles of paper that I use in my printer, along with some files that I keep handy. 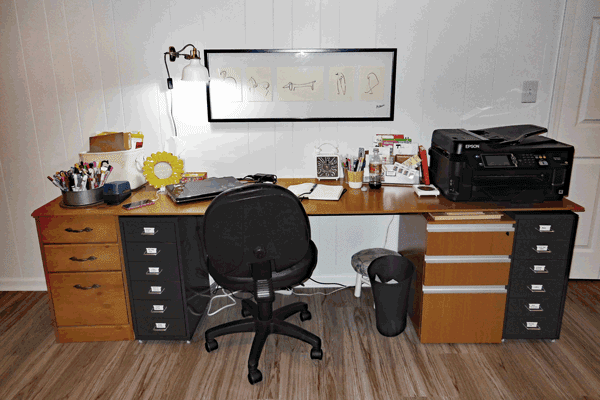 Above the desk are a Ranarp lamp and Picasso line drawings, both from IKEA. The printer is an Epson Workforce 7610, which I love. It has an extra large scanner surface and will print on 12 x 12 paper. 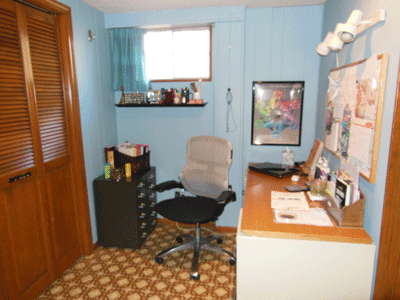 To the right of the desk are the doors to the storage area where I store extra kitchen items, framed pictures, and other items. These are new doors and I think they are so much better looking than the old louvered doors. Turning the corner, I have placed the chifforobe we inherited from my mother-in-law under the window. I use it to store gift wrapping supplies, fabric ribbon, and other items. On the top, I have lots of canning jars of various sizes holding craft sticks, clothespins, curtain rings, giant paperclips, and chalkboard signs. There's also a milk bottle-shaped vase, a candle, a container of round labels, and a bunny holding paintbrushes. Next to the chifforobe is my craft desk. 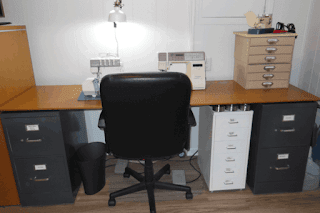 It is supported by two Alex units from IKEA, and has a storage tower from Knoll on the right side. The drawer units store stickers, punches, rulers, cards and envelopes, cardstock cuts, tools, tape, glue, and other crafting and scrapbooking bits and bobs. On the left side of the desk, I am using a Closetmaid shelf I bought from Target some time ago to make space to keep my Sihouette Cameo (top), Silhouette Mint (in the green box), and Scotch heat laminator (bottom). 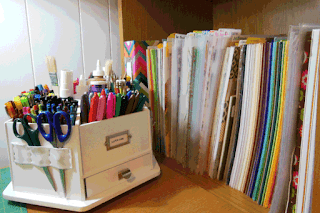 A Recollections™ Storage Desktop Carousel from Michaels holds scissors, Sharpies, pencils, and other pens and markers. Here is a close up of the cubby part of the storage tower, where I keep my 12x12 scrapbook papers. The patterned papers and paper cuts are sorted by color and kept in plastic envelopes. I used file tabs to label the envelopes by color, which helps me to find which one I want more easily. The solid cardstock is stacked together in rainbow order. I keep 9x12 cardstock in one of the tower drawers. 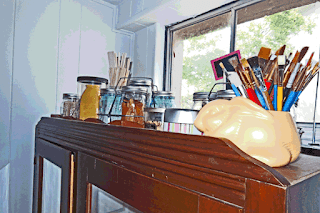 The other drawer contains self-stick and heat transfer vinyl for use with the Cameo. 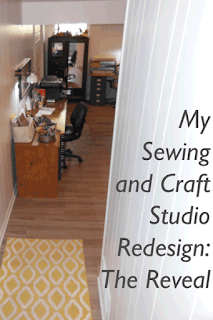 To the right of the tower is my sewing table. 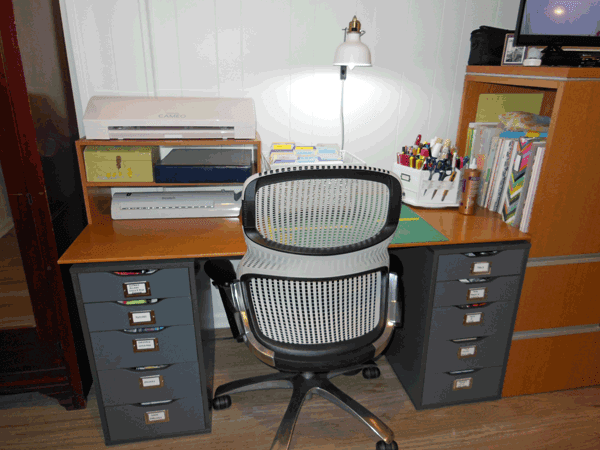 It is supported by two HON filing cabinets, which I painted gray to match the Alex and Helmer units. 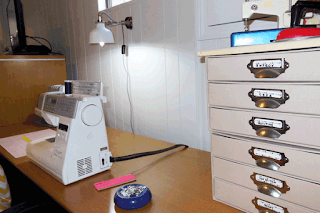 Three file cabinet drawers hold patterns and the fourth holds spools of serger thread. Under the desk is a white Helmer that I use to store sewing tools and notions. On top of the Helmer, I am using magnetic containers that are often used to store spices to hold my buttons, sorted by color. These drawers are two storage items that I've had for some time. I use them for thread storage. Two drawers hold regular sewing thread, others hold Sulky embroidery thread, quilting thread, and heavy duty threads, plus some miscellaneous items. Putting things on top causes the tops to sag (notice the gap between the two "boxes"), so I painted a small cork board that fits on top and hosts my childhood sewing machine and iron along with a few other decorative items. This is not the prettiest part of the room. 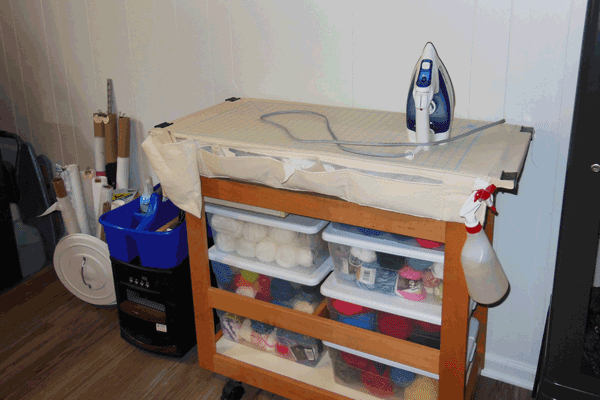 I have a step stool, my sewing machine cover, small ironing board,and a bottle of distilled water between the sewing table and the wall. Next to that is a white "trashcan" that holds my rolls of interfacing, craft fuse, and tracing paper. Next to that is a portable heater, because our basement has its own climate. 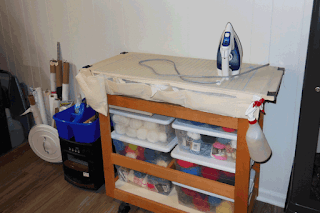 On top of the heater is a tote with ironing supplies: spray starch, pressing ham, point presser. Next to that is the ironing table I made from the center part of my old cutting table. The bins underneath hold all my yarn. 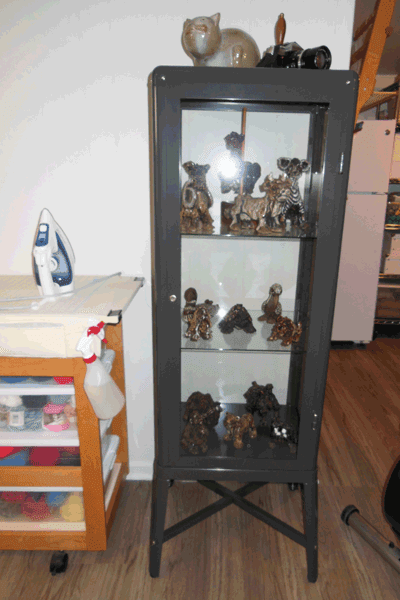 Next to the ironing table is a Fabrikor (IKEA) display cabinet with my collection of pottery animals. I have had this collection for almost twenty years, and have always yearned for a good way to display them. As soon as I saw this cabinet in the store, I knew it would be perfect! On top of the cabinet is a stoneware cat, my old (film) camera, and a school bell. This is the very back of the room, where you can see the refrigerator, the only remaining storage rack (except those in the storage closets), and a larger "garbage can" in which I store large rolls of fabric. There's a little fabric overflow on the rack: miscellaneous cuts in the three bins on the middle shelf, and burlap in the large bin on the bottom shelf. The two white trays on top of the bins has stuff for projects that I plan to start soon. Let's take a pit stop. 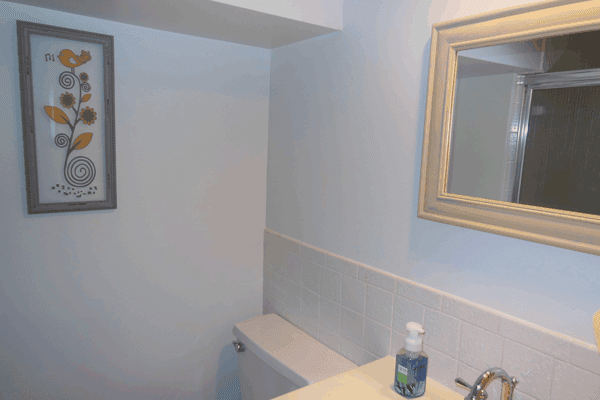 Here's how the bathroom looks now. I love how fresh and clean it looks with the new flooring and paint. 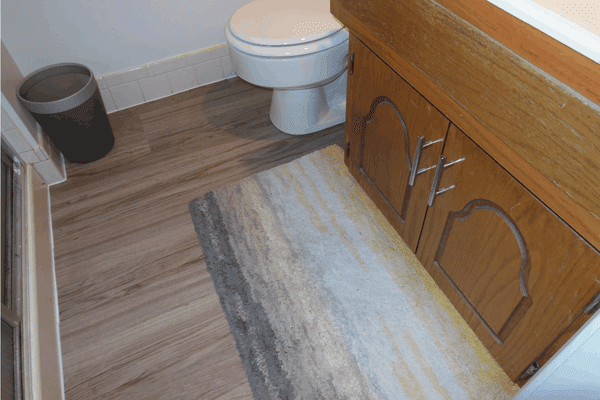 The vanity top has a little bit of yellow "veining" in it, so I picked up on that with the rug, artwork, mirror, and towels. I painted the mirror frame a golden yellow and after that dried, I wiped a gray paint over that. 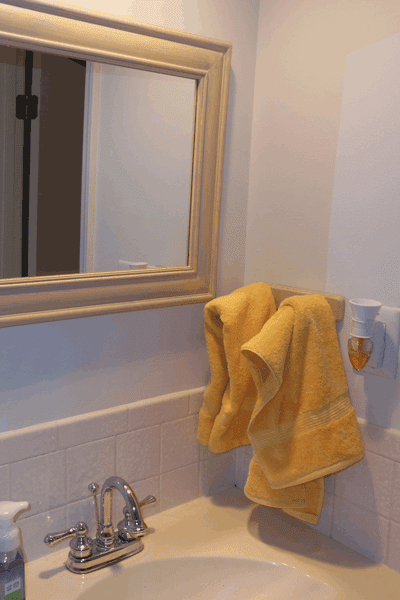 The base for the towel hooks is painted the same way. And now here we are at the end: chairs and stairs. The rocker will stay. You can read about it here. 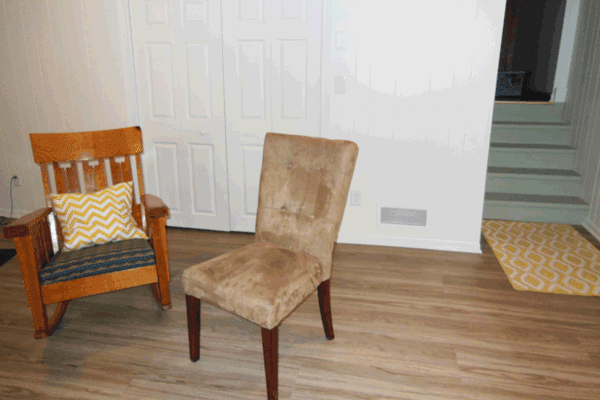 The parson's chair is waiting to be slip covered and moved to my guest room. I'd really like to have a cozy chair or small love seat here. That's it, we've looked all around the room—the perimiter, that is. I haven't shown you the cutting table yet. I'll put that in a separate post soon. Please leave me a comment! Is there anything you'd like to see in more detail? It is fabulous! Can't wait for the cutting table post. Thanks, Kristen! Check back on Monday for that post. May I Offer a Prayer?